Part of the blogging experience is visiting other blogs – for advice, for ideas, and in the case of this post, for inspiration. I recently visited Visionary Gleam, where Jim Lewis posted “O Tanenbox, O Tanenbox,” a humorous and poignant look at his family’s Christmas tree tradition and the story of the ornaments. I am a bit of a Scrooge when it comes to this most wonderful time of year, a fact that seems to worsen as I age. Jim’s well-written post, however, has left me thinking. A lot. No matter how cynical I have become, the Christmas tree has always remained my favorite part of the holiday. Now, as I drive around town and peek into the windows of my neighbors and see their decorated trees, I wonder about their stories – and I reflect on the ghosts of my own Christmas trees past – long past and recent past. Although I cannot remember that particular tree (but I would love a tree with meatballs), my first recollection of a Christmas tree was a large, green artificial one. Its branches, which had to be inserted into the trunk, looked like bottle brushes. I remember one early Christmas when my sister and I cut strips of red and green construction paper, looped them and interlocked them to make a chain, which still makes its annual appearance on my parents’ tree. Today, when I visit them, I can still see the handiwork of an 8 and 4 year old – not to mention my sister’s handmade angel ornament, with its toilet paper roll body, wings and head – and no neck. 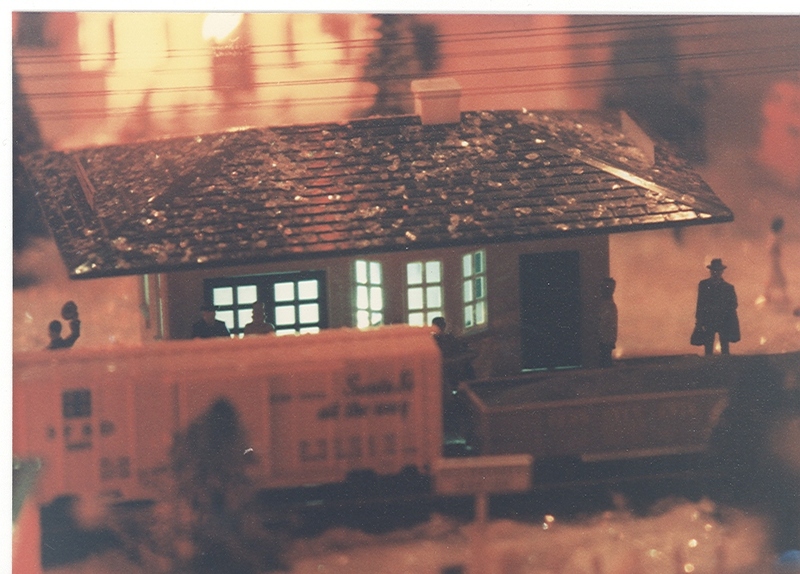 A few years later, my father received a sleigh-full set of HO gauge trains and Plasticville buildings from his father. On the day after Thanksgiving, my sister and I were given strict orders to stay out of the den – and we listened to that order, never peaking inside to investigate what was happening in there. 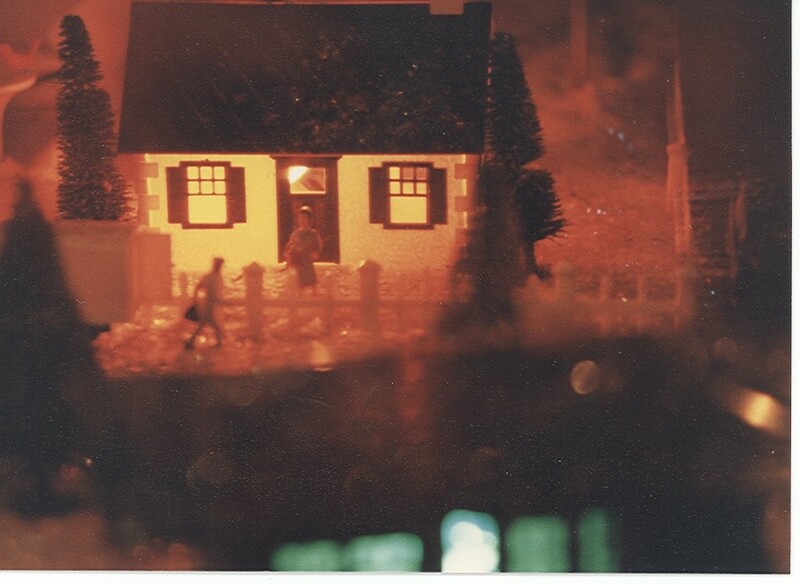 Each night, my father and mother would disappear into that room, carrying lumber and train tracks and a giant Christmas tree. Meanwhile, my sister and I strung cotton balls onto black thread – and these too disappeared into the room. Then the morning came when my sister and I were lead into the den, eyes shut tight. Once inside, the door closed behind us, we opened our eyes and looked into pitch blackness. With the flick of a switch, organ and chimes carols started, and street lamps were lit. Then houses and shops and the farm, their lights glittering on the mica snow. Trains began to circle the town, passing in front of mountains in the distance. At last, the tree was lit, swirled in angel hair and visible through a blizzard of cotton balls. It was an absolutely magical moment, one that delighted kids and adults as my family hosted an open house throughout the holiday season. What I remember most of these days is the peace found in that room, how neighbors would arrive to sit in there just to breathe, how joy could be delivered from a model train set, how the simplest of ideas (although monumental in my parents’ efforts) truly captured all that Christmas should be – something that seems to have gotten lost in today’s world. 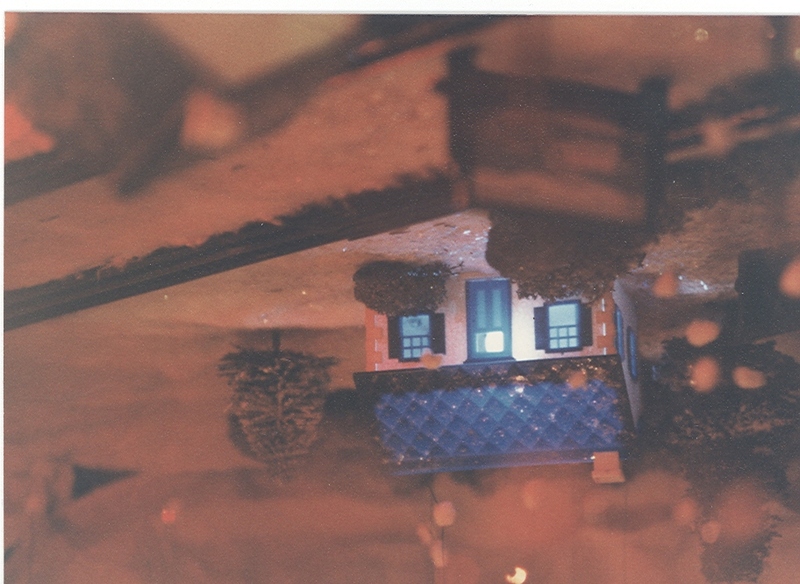 These photos, taken on an old camera decades ago and now scanned, capture small moments from that display. Fast forward to my first Christmas tree with Joe. Prior to meeting me, he had lived alone and already had his own idea of how a Christmas tree should look. He explained that he always gets a live tree, and it’s decorated in white lights, red ornaments, red bows and white candles (which we can no longer light because I won’t let him). I think “perplexed” would be the word to describe the look on my face. No colored lights? Ornaments all of one color? No garland or tinsel? Where’s the beauty in that kind of tree? I suddenly felt like Lucy in “A Charlie Brown Christmas,” horrified at the pathetic tree that Charlie Brown brought to the school auditorium. Nevertheless, I trusted Joe’s Christmas aesthetic, and once it was decorated, I had to admit that it was a beauty – something worthy of a Macy’s window display. I remember thinking that maybe I need to be more open and tolerant of trees that were decorated differently – although, I do place one ornament on the tree that isn’t red; it’s the ornament that commemorates our first Christmas together. In a previous post, I mentioned my bi-zonality. This is best illustrated in a tree story. Early in our relationship, I worked in NYC. It was cloudy and cold and gray, and it smelled like snow – but nothing fell from the sky. On the train ride home, the further east I traveled, the snow on the platforms became deeper and deeper. By the time I reached home, there was a foot of snow – what better night to go get a Christmas tree. Joe and I bundled up, grabbed the sled and trudged through the streets to the tree lot a few block away. There, under the white lights strung between the poles, we selected a tree – a process in and of itself – carried it onto the sled, and made the walk home, curtains of snow twirling around us, the only light coming from the neighbors’ Christmas lights. By the time we reached home, we were numb and exhilarated; frozen and warm. That moment is the closest I have ever come to a Christmas from an earlier, simpler time. We were in a Norman Rockwell painting. We were running down Main Street with George Bailey in Bedford Falls. It’s a wonderful life. I know this post breaks all of the unwritten rules of post length — but, like I said, Jim Lewis’s post on Visionary Gleam had me thinking a lot. Thank you for sticking with it. Enjoy the holiday season — and enjoy the trees and the memories they create. ← Not-So-Wordless Wednesday: Gardeners Beware! Thanks, Kevin, and I’m glad you enjoyed my Tanenbox blog.. We do seem to have a similar irreverent sense of humor, but are sentimental to the core. My alleged “garden blog” is a bit of an acquired taste, as I often make fun of the very people who read it, but still….at the end of the day, cultivating a family and a garden are one and the same. Jim, I do think you do an amazing job with your blog — humor and emotion and inspiration all rolled into one. It’s always good to be able to laugh at oneself. Thanks for all the beautiful memories. Mine go back a little further. I remember the enclosed porch in our apartment being off-limits to 4 year-old me, beginning the day after Thanksgiving. The French doors would be covered in brown craft paper and it was too cold to go out there since the room was unheated. When I awoke on Christmas morning, I would be led out to the porch, where the same basic scenario would take place. The scratchy sound of the organ and chimes music, followed by the streetlights and houses being lit and the trains running around the track, the “blizzard” of snowflakes in the house, amid the fragrant smell of fresh balsam always took my breath away! Santa had done all this in one night! Magic! Friends and neighbors coming in to see the spectacle – it was always bustling during the week after Christmas. Then, my big brother went into the Navy, and the village was never set up again. For years I asked why it wasn’t there only to be told it was so much work. When your Dad finally got the “set-up” and began showing it, the joy and magic of Christmases past returned to my heart. I love a well written post no matter how long. and I love a Christmas tree with memories for ornaments. Your old photos were captivating and I can imagine how excited you must have been when that tree was unveiled. Marguerite, thank you for your kind words. We always say that Christmas is meant for children, to spark wonder and awe. Maybe as adults, we need to treat ourselves to that wonder and awe — especially when wh live in a world that seeks to rob us of that. Happy holidays! Lovely post. I enjoyed the pictures, and could feel the awe that must have been felt by the entire neighborhood as they viewed your parents handiwork (and the children’s, too). Every once in a while we get those Normal Rockwell moments, and they are glorious. I think we need those moments more often — simple and beautiful. Enjoy the holiday season! great blog…sweet and funny. I just read XanthusKidd for another view on Xmas decorations…so funny…you might like it too…. Lilith, thanks for the tip. I’m on my way to check it out. Kevin, I just wanted to say that I really enjoyed this post and I want to add that when someone writes from the heart like you did, people will read it and they’ll be thankful for the length. Your post, as well as Jim’s post, have made me think about my holiday traditions in a new way. Chad, I’m very happy that you enjoyed the post and for your kind words. Wishing you and your family a holiday season full of memories. Cynthia, it’s amazing what parents will do for their kids — and doubly amazing to think they did this in the midst of all the other holiday madness. Kevin, This was delightful. 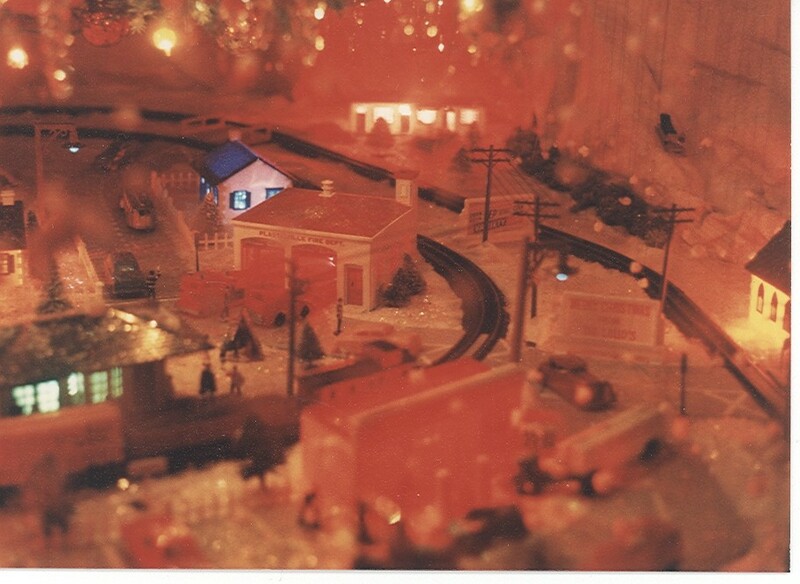 Jim’s post got me thinking about Christmas trees, but yours got me thinking about ornaments and the magic of model trains. (In my family, the trains got handed down from boy to boy, but my older brother was pretty generous in letting me share the fantasy. I was particularly enraptured with a passenger car that had silhouettes of passengers in the lighted windows; it triggered serious wanderlust.) My Christmas tree style is definitely closer to your than to Joe’s. I still have tattered paper stars that I made decades ago. One year, I hosted a tree-trimming party and my then-department chair asked me what my tree-trimming style was. I jokingly replied that my tree style was “tacky.” He took me up on the challenge and arrived at the party bearing the tackiest gift ornament I’ve ever seen — a lobster claw dressed in a red Santa hat! I still laugh every year when I hang it on the tree. Memories–It was started by my grandfather in a carraige room of an apartment house in Brooklyn.Then by my father on the porch of our apartment in Queens and later by your father in our den here on Long Island. It was done for the love of family and friends and the magic of Santa.Every holiday season someone will mention the set-up and ask if I’m putting it up. If you remember I started the day after Thanksgiving and completed it the week before Christmas. it was “Open House” from then until after New Years. 500 to 600 visitors were not uncommon. Today something is missing from Christmas. It’s sad. Right now the set-up resides in the eaves of our home awaiting to be passed on. Its here whenever your ready. Hi Maria. Happy to bring you on a walk down memory lane. Keep making memories.